I took a long time off from transferring my family films to digital. I wasn't happy with how long it was taking me to get the results I wanted. I finally implemented some upgrades I had been planning for some time. I first reconfigured an i5 computer running Windows 10 with an SSD drive and a Blackmagic Intensity Pro Capture Card. My previous capture station was an old quad-core running Vista. I use my MovieStuff Dual 8mm and 16mm Workprinters to scan and capture the film in HD frame by frame. The capture format is Blackmagic MJPEG. My first post editing computer I built myself when I retired 9 years ago. It has a 1st generation i7 processor and 12 gigs of RAM. I replaced the OS drive with an SSD a couple years ago which did speed it up alot, but I needed the extra speed of the newer 8th generation i7's to handle the rendering demands. I bought a Dell computer a month ago that had all the components I would have wanted if I was building it myself. So far it's doing well. I use AviSynth to do the initial cleanup,de-graining, stabilizing, and frame rate conversion exported to a Lagareth (LAG) lossless codec file. I then import the LAG file into Premiere Pro to tweak color, levels, more grain reduction, and final editing. I can then export the finished version to various video formats and/or to DVDs. 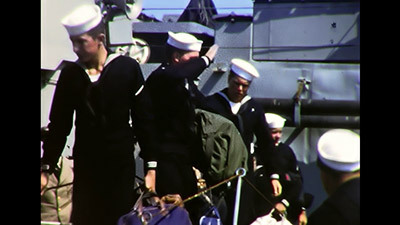 Here are a couple excerpt clips taken from a reel I transferred this week for my step dad. While I do think they look very good, I would be interested to know what you uploaded to youtube in terms of 720/1080p and file size. 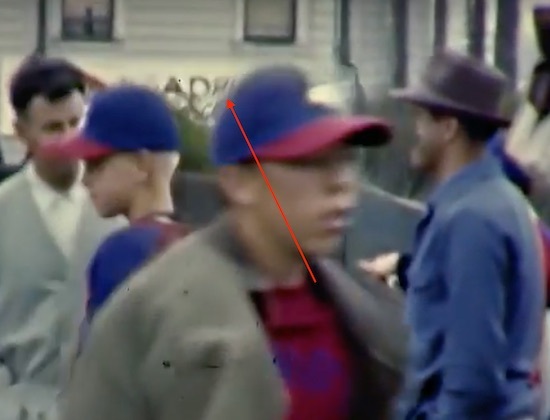 I am seeing some strange artifacts around the edge of the frame and things looking a little soft in focus. That could be youtube, or of course, the original footage. That said, I think you've done a great job. Hi Mike...As you know you can tweak these captures forever and not get them perfect. In a 400 ft captured reel I find over exposures...under exposures...in focus...out of focus...sharp images...soft images...heavy grain... and light grain. The variances are endless. 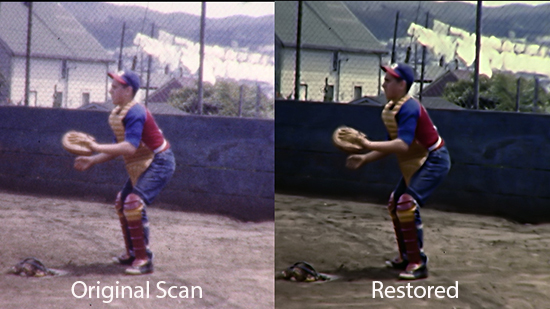 When applying restoration filters I try to hit a happy medium that will improve the over-all watch-ability of the films. 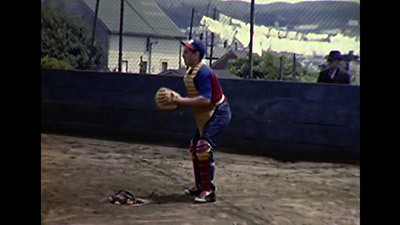 To obtain perfect filtering throughout a given frame the images would have to be masked so one section would get less correction than another section. The original footage was captured at 1080p, but I reduce it to 720p with the AviSynth scripts. For YouTube it is output to 720p, .mp4, H.264. More artifacts show up in the YouTube version...but that's typical. Very interesting Werner...I'm hoping the more of these I do the better I'll get at adjusting the filter parameters. I notice less distortion or artifacts when image motion is not too rapid. I think my goal is to do some cleanup and stabilization without over filtering. The filtering parameters can change from scene to scene and is quite time-consuming. I'll just pick certain scenes to give added filtering attention...like the couple I've posted. Over-all the results for me are heading in the right direction. Outstanding as always Janice. 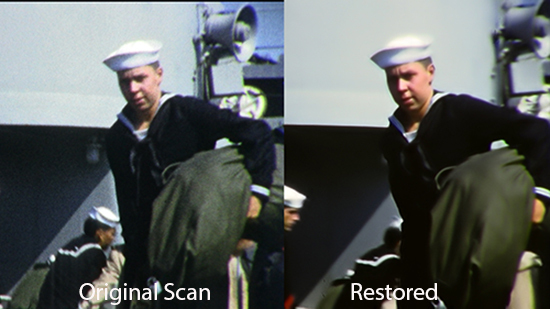 Perhaps you should do a side by side comparison sometime to show the difference between the original capture and the "restored" version to help people understand what you have to work with. Thank you John. Good idea I don't have time to do a video comparison on these two transfers...but here are a couple screen caps that compare the original scans to the restored versions. If interested...I do have a comparison video I made when I was first starting 16mm transfers. I didn't have a frame by frame scanner at that time...but the restoration results of the realtime captured footage was still very good. Wow Janice! Great Job! The scans speak for themselves! The difference is immediately noticed on my screen. Excellent conversion, Janice! These movies look REALLY good, and I appreciate your explanation of the technical components and steps you took to achieve these results. You should contemplate writing a book on this and other areas of your expertise regarding film-to-digital conversions, projectors, and other related skills. Keeping your converted movies in mind.. just how good is some of the better (?) film-to-DVD services in converting Super 8mm film to digital? I've steered away from having a commercial outfit converting my films because of fears that they would lose or damage the movies, and that the final product may not be much better (or worse) than what I could accomplish on my own. The problem is that I don't know anyone who has had any Super 8mm digital conversions done, so I don't have anything from which to compare. The loaded question - how does Janice's films compare to some of the commercial conversion of film? Kev I am trying to find a house in the UK as I have decided to have some footage scanned properly. Quite a few to choose from but knowing which is the best, is a conundrum. Hopefully in the New Year I can send some film off and hope for the best. Mike, that would be great! Good luck on your home search. 1. What equipment are they using? Definitely you want frame-by-frame captures using professional equipment. 2. What is the capture format? This will depend on what you want to do with the captures.If you have a lot of storage space to save uncompressed files then this will yield the highest quality. However uncompressed files are huge and if you want to do any post editing you will need a high-end computer. A compressed lossless version might be more managable. MJPEG for PC's and PRORES for MAC's. 3. Will they provide you with the original capture frames without any framerate conversion? This is if you intend to do post production yourself. 4. What filtering adjustment do they offer? ?Color correction? Exposure adjustment? Grain reduction? 5. 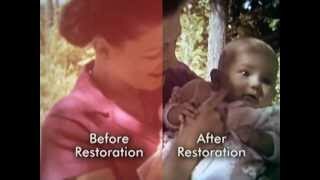 Do they make filtering adjustments on a scene by scene basis as they are capturing...or do they do restoration in post? 6. What file formats do they output? Do you want a frame-rate adjusted copy in a particular format...MPG2 (for DVD), AVI..PRO RES, MP4? 7. What media types can they provide to you? Will they burn files to a DVD/BlueRay or place files on a Hard Drive that you or they provide? Hi Janice, that moviestuff scanner looks good, I presume it wasn't cheap? The 7 points you raised when getting films transferred, can you expand on the answer you would like and the reasoning and finally a price you would expect to pay. Example, editing/colour correction obviously takes times so you expect to pay a lot more? You see a lot of these on ebay charging very small amounts for conversion and it makes you wonder what they actually do? You are a treasure of information in this forum. Mark Davies... I'm not sure which MovieStuff scanner you are referring to. Mine is one of the original MovieStuff Workprinter XP's. I bought it some years ago from a fellow video editing friend for $500. It was designed for SD transfers. However I've added about $500 in upgrades to make it HD compatible. It's definitely not as sophisticated as the new MovieStuff Universal Retro Scanners, but I'm satisfied with the results. My 16mm Workprinter I bought this year from a guy in the Neitherlands. It was around $1300 w/shipping. For me this has been a fun adventure learning and experimenting with different processes. There are pros and cons to all transfer methods, and each can be useful with fitting expectations. It's been a great hobby for me. I tried to elaborate a bit more in the suggested questions above. The issues are that everyone has different expectations and requirements when using a transfer service. I don't have a clue to what services charge these days. However...I don't think I would trust anyone on Ebay with my films. I would do a Google search. A good website will tell all the services they provide and the cost. I would only use a company that posts their contact information and call them with questions and concerns. If they are reputable they should welcome your call.